charming and full of services hotel, in a quiet location but just a few kilometers from the beaches and the nightlife along the coast. 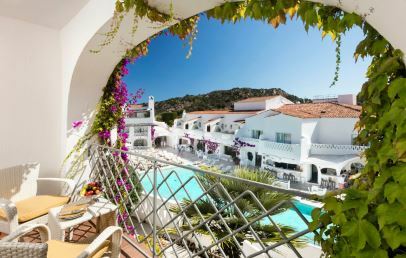 Northern Sardinia is one of the locations most sought after for holidays in Sardinia. 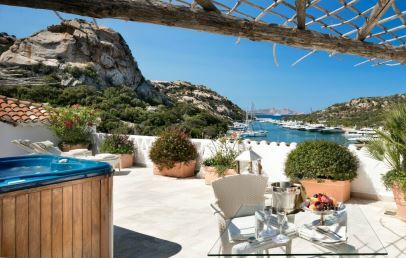 The location of Poltu Quatu is on the North-Eastern coast of the Island, in a point midway between two major touristic spots: Baja Sardinia and Porto Cervo. 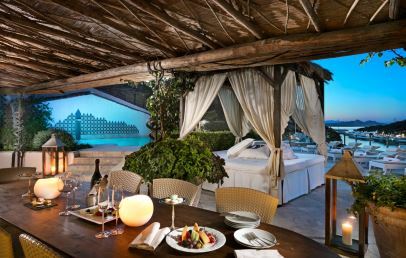 The position of the Grand Hotel is such that it can satisfy the double requirement of intimacy and fun. 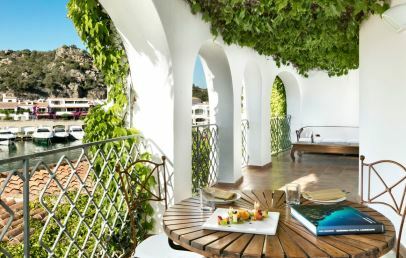 As its name implies, “Hidden Port”, privacy is guaranteed by the lush mediterranean vegetation surrounding the Hotel and from an average of 3 km from the nearby villages, more populous during summer. The activities, the shopping and the “movida” are reachable in a few minutes by car. 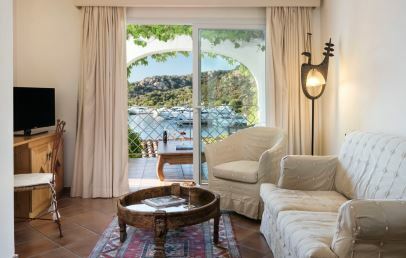 The Grand Hotel Poltu Quatu can boast a vicinity to Olbia Airport (35km) and a private harbour for customer’s boats with excellent services. The Grand Hotel Poltu Quatu is a 5 star hotel, guaranteed by the renown brand “MGallery by Sofitel”. Luxury, accuracy and style are the adjectives that most suit it, and that are always accompanied by a deeply felt attention to hospitality. Immersed in the green and protected against winds, it features two outdoor pools, one of them suitable also for children. Inside the hotel it can be found a shopping area, several restaurants and an advanced congress hall. 145 rooms divided in different categories as well as suite. Classic – 18 sq.m. mountain or street view. Superior – 20 sq.m. pool or garden view. Deluxe – 20 sq.m. sea view on Marina dell’Orso or firth view. Junior Suite – 24 sq.m. pool waterfall view. 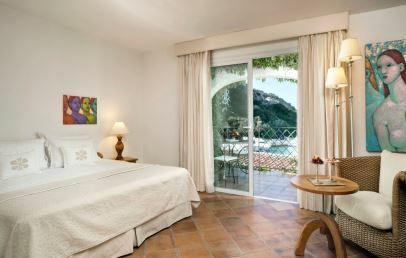 Executive Suite – 100 sq.m., two bedrooms with sea view on Marina dell’Orso. Royal Suite – approx. 100 sq.m., ont two levels. Two bedrooms with terrace, living room and kitchen. Sea view on Marina dell’Orso. 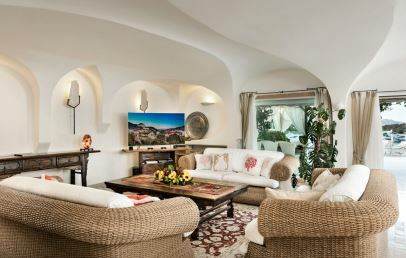 Presidential Suite – 180 sq.m., one bedroom and 3 additional ones on request. Living room with kitchen, 250 sq.m. terrace with private pool. Separate entrance and sea view. The apartments of the Poltu Quatu Residence are located in low buildings set in lush greenery, approx. 150/200 m from the reception. 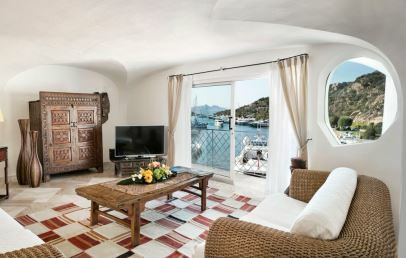 They have one or more bedrooms, hideaway kitchenette with wooden doors, large living room, furnished terraces overlooking the gardens and the village. Each apartment can accommodate an extra person. Internet connection available. Guests staying in the apartments have all hotel services included (swimming pool, beach shuttle, breakfast at the restaurant, daily cleaning). Cleaning of the kitchenette on request, bookable on-site; cost of € 30 per service. 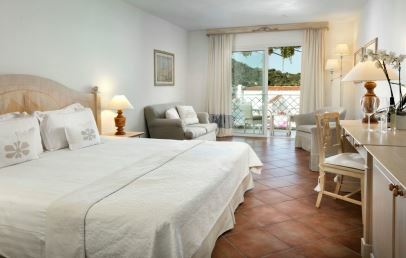 Two-room apartments – one bedroom, one bathroom, kitchen, dining room, terrace or balcony. All offer views of Poltu Quatu village and gardens. Sea view available on request for an extra charge. 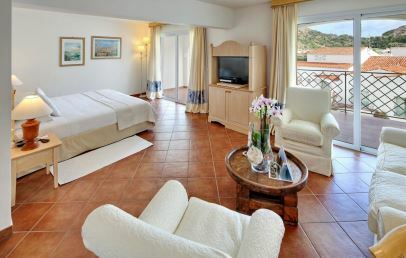 Three-room apartments – two bedrooms, two bathrooms, kitchen, dining room, terrace or balcony. All offer views of Poltu Quatu village and gardens. Sea view available on request for an extra charge. Four-room apartments – exclusive penthouse with a terrace overlooking the sea, three bedrooms, four bathrooms, kitchen, dining room. The Hotel Poltu Quatu offers a complimentary shuttle service for two nice beaches. “Liscia di Vacca” at 2 km distance and “Grande Pevero” at 6 km distance from the hotel. The beaches are equipped with sun umbrellas and lounger for the guests of the hotel. The complimentary shuttle service is available all day, run frequently. The Hotel Wellness and Health Centre has a Turkish bath, a sauna and a lounge with color therapy. Guests can choose between a range of treatments for face and body including the innovative "Hot Stone". For fitness enthusiasts the Hotel proposes a modern gym and professional instructors for tailor made fitness exercises. At the Grand Hotel you will find 2 tennis courts, a football field, a diving centre and a sailing club. The renowned Golf Club “Pevero Golf” is nearby the Hotel and there are also riding schools. The philosophy is based on an Italian contemporary cuisine with a touch of Mediterranean & Sardinian flavors. The restaurant "Maymon" is the main restaurant with sea view, open for breakfast and dinner. By the pool is the restaurant "Ishter" open for lunch. "Canteen" is the Mexican Restaurant and a Restaurant / Live Music Bar "Aruana Churrascheria Poltu Quatu" are waiting for you. The hotel staff and a skilled Concierge will help you booking activities, internal and external services. We would like to remind you that it is possible to book (with extra charge) baby sitting services or game room activities. Ishter and Maymon Restaurants and the Congress Centre of 450 sq.m., allow to organize private ceremonies and small or bigger events. Double room, elegant and cozy. The terracotta floors, embroidery carpets and curtains reminds the Sardinian tradition. The private bathroom has a wide marble top, bathtub with shower, hairdryer, make up mirror, bathrobe, slippers and complimentary toiletries. The classic rooms have a wonderful mountain view and a side view on the street near the Hotel. Double room, elegant and cozy. The terracotta floors, embroidery carpets and curtains reminds the Sardinian tradition. The private bathroom has a wide marble top, bathtub with shower, hairdryer, make up mirror, bathrobe, slippers and complimentary toiletries. 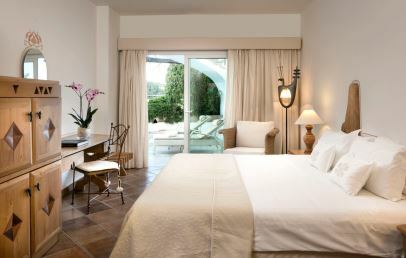 Superior rooms have a beautiful pool or garden view. Elegant and cozy Suite. The terracotta floors, embroidery carpets and curtains reminds the Sardinian tradition. 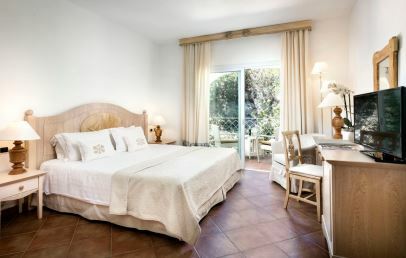 All rooms are divided in an living corner with a double sofa bed or two single bed. The private bathroom has a wide marble top, bathtub with shower, hairdryer, make up mirror, bathrobe, slippers and complimentary toiletries. Junior Suites have beautiful balconies with a view on the pool waterfall. Double room, elegant and cozy. The terracotta floors, embroidery carpets and curtains reminds the Sardinian tradition. The private bathroom has a wide marble top, bathtub with shower, hairdryer, make up mirror, bathrobe, slippers and complimentary biological and complimentary toiletries. 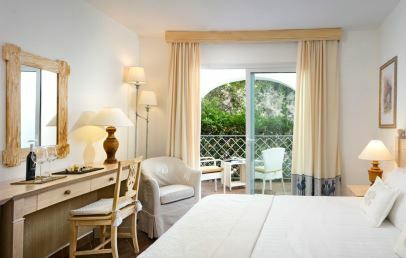 Deluxe rooms sea view on Marina dell’Orso or firth view. Elegant and cozy Suite. The terracotta floors, embroidery carpets and curtains reminds the Sardinian tradition. All Suites have a bedroom and a separate living room that can be set as a second bedroom on payment. The private bathroom has a wide marble top, bathtub with shower, hairdryer, make up mirror, bathrobe, slippers and complimentary toiletries. Our Suites have a terrace equipped with tea table and chairs with a wonderful sea view. 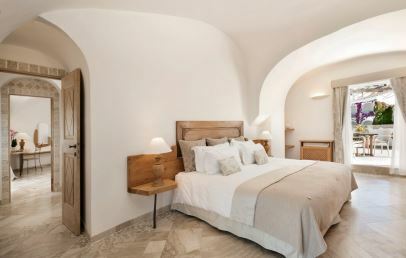 Elegant and cozy Suite with its own unique style, is composed by a bedroom connected to a second bedroom and a living room. 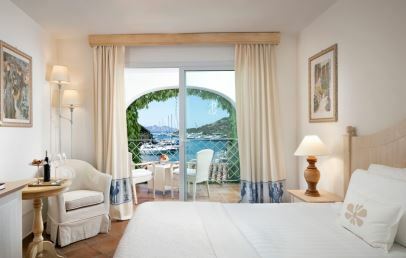 The Executive Suite overlooks the beautiful natural Marina dell'Orso fiord. 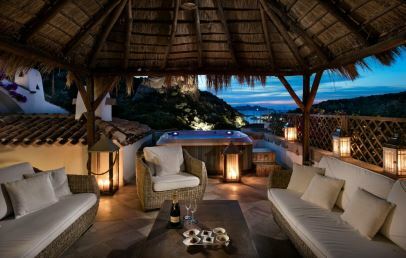 Its terrace is provided with a 4 seats Jacuzzi with sea view. 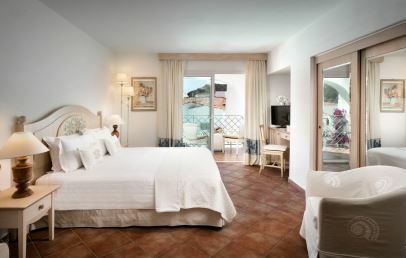 The terracotta floors, embroidery carpets and curtains reminds the Sardinian tradition. Each area has a private bathroom – one of them has a whirlpool stand-up shower. Large and classy Suites with their own unique style, on two levels at the centre of Poltu Quatu with sea view and two large terraces. Upstairs they have the sleeping area and the living area is on the lower floor. Both bedrooms have a private bathroom with bathtub/shower, hairdryer, make up mirror, bathrobe, slippers and complimentary toiletries. Downstairs there is a luminous dining room with a separate kitchen (the catering service is available 24 hours, on request, or if wished a Chef can be organized, with supplement) and a living room with two large sofas and soft ivory cushions. On request it can be connected with two Deluxe double rooms. 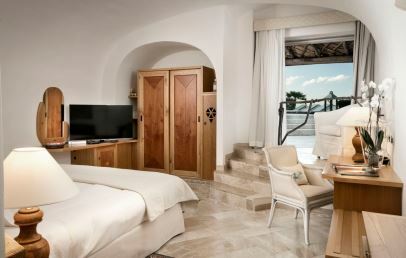 The Royal Suite recalls the Sardinian tradition with its terracotta floors, embroidery carpets and curtains. Chic details and oriental decors gives a particular beauty to these rooms. The terraces are fully equipped with chairs, sofas, tea table and sun lounges and offer a Jacuzzi for 4 persons with sea and pool view. Luxurious and prestigious Suite with its own unique style with large and bright areas. The Suite has a master bedroom, a dining room and a working area equipped with a desk, a copying machine with scanner and fax facilities. The marble bathroom has a whirlpool tub, hairdryer, make up mirror, bathrobe, slippers and complimentary toiletries. On request three independent double rooms with own bath can be connected with the Presidential Suite and one of these rooms has a small terrace with Jacuzzi. 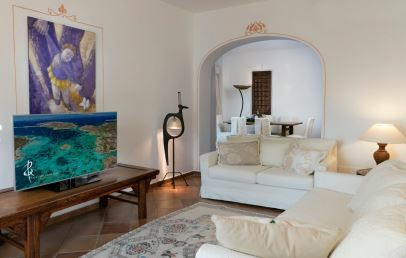 The living room is divided in a dining and several relax areas with sofas, armchairs, marble floor, art design objects, oriental carpets and several comforts. A small separate kitchen could be used, as well as a catering services or a personal Chef can be organized upon request and with supplement. 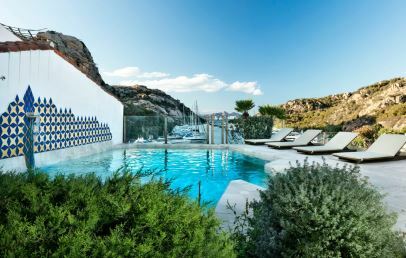 The panoramic sea view terrace of 250 sqm has a private pool (8x5m) made of Sardinian granite and is equipped with sun beds, gazebo, a dining table for 8 persons. The Presidential Suite has further an independent entrance. 15% reduction! The rate is a non-refundable one and the total amount of the stay is to be paid upon confirmation. 5% reduction! The rate is a non-refundable one and the total amount of the stay is to be paid upon confirmation. 10% reduction! The rate is a non-refundable one and the total amount of the stay is to be paid upon confirmation. 20% reduction! The rate is a non-refundable one and the total amount of the stay is to be paid upon confirmation. 10% reduction for bookings confirmed at least 8 days before the arrival. 15% reduction for bookings confirmed at least 8 days before the arrival. 5% reduction for bookings confirmed at least 8 days before the arrival! 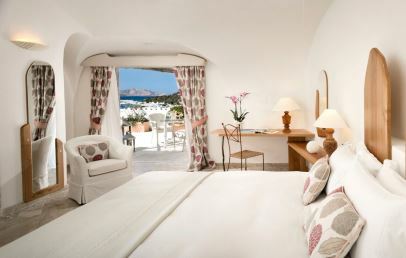 Special 10% reduction for stays from May 1st to May 31st (excluded May 13th-15th and May 17th-18th)! Suite Offer (valid only in BB basis, minimum stay 3 nights): Welcome amenities and 1 3-course dinner for 2 people at the main restaurant (beverages not included)!